Father Romek Janowski missionary and chaplain in Zambian prisons was born in 1958 in the small village Kodeń in Podlasie, Poland. The call to missionary service awakened in him during his military service. He graduated from the Catholic University of Lublin, his master's thesis was about the morality of people in Zambia. He joined the Divine Word Missionaries and since 1988 has been working in Zambia. When asked where he would would like to spend the rest of his life his answer is - in Africa. He says that he now considers himself black and feels that his friends are there. When he talks about them you can see the sparks in his eyes. He talks about the emotional moments, he as a priest experiences during religious rites, and about the contact with the faithful, which in Poland is difficult to find in this form. To Poland he comes back for a three-month vacation every three years. And here at the same time he would like to accomplish his mission - to wake up in the hearts of the youth missionary vocations. He admits that it is very difficult. Often those who have become involved come back after a few months or years. In Zambia he has many friends and doesn't feel lonely. He knows they are waiting for him to come back from his holiday. He promised them he would. 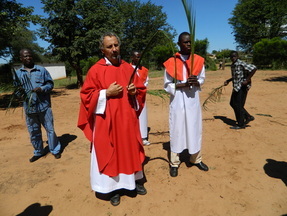 Since 1998 Father Janowski works as a chaplain in Zambian prisons. He provides pastoral support for inmates in Livingstone and in a correctional facility for young people 45 km from Livingstone. In the latter adults aged 9 to 22 are detained. He knows and feels what they need. Contact with them is possible in English, German, Spanish and several Zambian dialects. If these are not enough Father Janowski asks for help from interpreters. In addition to pastoral work he does something for the soul - football and fishing. As he says, even a crocodile, which mistook him for a fish and wanted to bite his leg off didn't manage to discourage him.